Yes, this was a Lifetime movie. This network usually follows a formula of damsel in distress meets hot dude who rescues her. Or woman takes drastic action against abuser and the legal drama that follows. As cheesy as many Lifetime movies are, women watch these shows because they can relate to them. Say what you will about Untouchable, but where it did succeed was in giving viewers a taste of what life was probably like for Peterson’s wives. This guy comes across as a raging narcissist and to me seems to be a textbook sociopath. His world revolves around… him. He, as I just discussed in my Courageous post below, tries to maintain a heroic public persona, complete with the stereotypical mustache of authority, while skeletons literally lie in this guy’s closets. I was disgusted that media outlets this morning were blaring Peterson’s reaction to the movie. What did they think he was going to say, “gee, there’s part of it that really hit home for me?” The media’s focus on Peterson has been a stumbling stone in the path of justice throughout this whole saga. As vampires of his type are known to do, and this is so transparent to me, he’s succeeded in drawing attention away from his victims and onto himself. Frankly I’d be much more interested in hearing what the victims’ families and friends have to say about Untouchable than see reporters clamor to post what this suspect is bellowing from his cell. Another beef I have with the way the media has handled the Peterson case is that they have focused cargo ships full of attention on this case to the detriment of other missing persons and murder cases. Homicide and suicide happen all the time in police officer relationships, yet only a select few cases dominate the airwaves, sensationalized by crusaders for justice who constantly run “breaking news” banners on their shows. To understand just how much this goes on in law enforcement, please visit the Behind the Blue Wall blog at http://behindthebluewall.blogspot.com/. The media’s laser focus on the Peterson case may have people thinking domestic violence of this magnitude is a fairly rare occurence in police families. The stories featured on this blog cover just some of the cases, and only some of the cases that make it to the media. The person who runs the site is not a cop hater, but someone who, like me, believes that conditions for victims of officer-involved domestic violence will never get better until police culture and our society are honest about the extent of this violence. Some of the lines used in the movie are being panned for their cheesiness without acknowledging that self-absorbed people really do say the darndest things. They are not always rational and really do come out with some shocking and awkward statements sometimes. In one scene, Peterson was basically reminding his wife how lucky she was to be with a man who had his size of male member, and she said, “have you been in a men’s locker room lately?” Some guys really do think they’re God’s gift to women and like to remind women that they are “exceptional” when their sexual skills may be average or below. Narcissist red alert! People often ask domestic violence victims why they don’t just leave. You can’t “just leave.” I’ve said it many times, but the risk of homicide goes up 75 percent when you leave an abusive relationship. The abuser may not want you, but he still wants control over you. If he believes he has to kill you to keep you from regaining control of your life, there’s a good chance he’ll do it. He may kill your children, pets, coworkers, or relatives too. Cops’ careers are based on power and control, and the ones who choose to abuse flaunt that power and control mercilessly. Leaving could be signing your own death certificate, because how dare you act like your own person and “rob” them of their “authority.” By leaving you also risk exposing the deeds they’ve worked so hard to conceal. Men like Peterson in this movie are masters of what’s known as crazymaking (also known as gaslighting), tormenting and badgering their victims mentally to the point that victims start to believe there’s something actually wrong with themselves. Peterson referred to his third wife Kathleen as “the crazy lady” at least several times in Untouchable and made sure everyone around him knew that she was an unstable, vindictive, emotionally off-balance predator who just wanted poor him to suffer. Crazymaking is just one way to make the victim look like the suspect and vice versa. Also note that some abusers are so relentless that they actually can cause their victims real problems. They are the victims, master spin doctors whose lies and excuses pour out of their mouths effortlessly to make the real victim look like the suspect. I mention this quote over and over in my blog, but as Martha Stout, author of The Sociopath Next Door says, the most universal behavior of unscrupulous people is… an appeal to our sympathy. Abusers who are effective at this become the poor guy with the challenging wife, the longsuffering father whose kids are being poisoned by their mother. Onlookers say, “he’s such a nice guy,” “he doesn’t deserve that,” “she’s a piece of work.” They generally don’t stop to ask the partner for her perspective; it’s obvious the “poor guy’s” got the short end of the stick and he doesn’t need you stirring things up by asking for his wife’s view, right? Wrong. Someone who has to go to such lengths to stir up sympathy might just have more going on than they’re letting on. Sympathy provides a smokescreen and diverts attention away from the victim onto themselves. As portrayed in this movie, Peterson was only interested in the honeymoon phase of relationships. He got a thrill out of overlapping his relationships, using the time-worn phrase, “I’m still technically married.” Many con artists do this, saying, “I’ll divorce her,” “I’m in the processing of divorcing her,” “It’s completely over with her,” “I don’t feel anything for her.” But they thrive on their own cunning as they act out their fantasy of a sailor with a woman in every port. In Untouchable, Peterson gets an obvious rise out of sneaking young Stacy into his house while his wife and children are sleeping. However, once they settle down and the thrill of the new relationship starts to wear off, the abuse starts. They’re out of the honeymoon phase and in his twisted mind she’s to blame for the ensuing “boredom.” He needs constant stimulation and settling down into routine life, with its less than perfect daily circumstances, is unbearable to him. Speaking of children, some researchers theorize that sociopaths have an instinctive drive to spread their seed all over the place and ensure the continuation of their line. Some such abusers do this. They just keep having children and may use successive women to care for those children. I’ve seen this in real life and the children wind up not having a real father, but a Disneyland father who “works so hard” to support them that they “understand” why he’s not around. These guys are too busy tending to their new interests to be appropriately invested as husbands and fathers, and there’s always an excuse as to why they can’t make it to ____ (name an activity). Drew Peterson made his fourth wife Stacy carry a cell phone constantly in this movie. This is also a common abuser tactic. He initially said that he needed to know she was “safe.” He was not motivated out of love or wanting to protect his wife, however, this was about control. He was irrationally paranoid about what his wife might be doing behind his back and needed to know her every move. There was one scene where he was spying on Stacy while in a marked police cruiser with a partner. It is reality that department resources may be used to keep tabs on a victim. This picture also touched on how abusers may rage at their victims about things they are actually doing. In Untouchable, after Stacy hugged her brother-in-law at her sister’s funeral, Peterson asked her how long she’s been “banging” him. Then he attacked her in bed and asked how many times she’s “banged” him. A simple hug on a grieving family member can trigger the jealous rage of an abuser. They perceive it as a threat even though there is no threat. They are so mired in their own alternate reality that while they are away on vacation cheating on their spouse, they will call her and ask who she’s in bed with. They are, once again, making the victim the suspect. The bed scenes in this movie were also realistic. Cowardly abusers will attack their victims where anyone else is least likely to witness the abuse. Rob Lowe’s Peterson also threatened to kill his wives at such moments, in both veiled and overt tones, in ways that couldn’t be proven. If you’ve heard the phrase “he said, she said,” that means that it’s her word against his. Guys like this are unlikely to threaten their partner in the presence of her friends or family. They get a thrill out of the fear and control they have while sneering that they’ll kill the victim when no one else can hear them. It’s also a way of deeply disturbing a victim emotionally so that only the symptoms will show in public, not the cause. A final common abuser tactic that this movie covered was Peterson’s knack for demonizing his ex. Yes, some exes really are as bad as they appear, but I’ve learned to be suspicious of men who’ve been “horribly wronged” by their exes. Some won’t stop talking about how bad their exes are, and that may be a way of trying to bury the unfinished business or feelings they still have for them. It may also be concealing the fact that they’re still physically involved with them. Stacy’s experience in the movie version was that Kathleen, Peterson’s third wife, was a truly horrible person who incessantly harassed them. But Peterson convincing her of that just strengthened her loyalty to him because it evoked her sympathy. It made her believe that Peterson’s kids had a desperate need for a real mother. 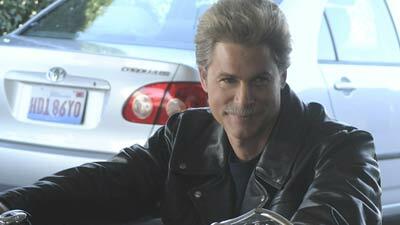 Rob Lowe was genuinely creepy is this movie. Obviously Lifetime knows that casting someone who looks like him will draw more interest than someone who looks more like Drew Peterson. Regardless of what women think of Peterson’s looks, he seems to have that sociopathic draw, that hypnotic energy, that entices unsuspecting women. He may also appear attractive to some women in that he was an authority figure, that he was a father figure, and that he seemed financially successful. A manipulator doesn’t have to be good-looking to have power over his victims; he just knows how to play his cards to reel in his targets. Please note that Peterson became engaged again in 2009, and after his intended left him due to her father’s ultimatum, she came back. After that she blindly defended him. I find absolutely nothing attractive about Drew Peterson, but there is a sinister energy that surrounds him like a cloud. When people are living in that cloud, they see a mirage or an embellished version of reality. You see what they want you to see. To learn more about the kind of abuser that was portrayed in Untouchable, I’m going to recommend the book I always recommend, Sandra L. Brown’s Women’s Who Love Psychopaths, http://saferelationshipsmagazine.com/. It delves into both suspect profiles and victimology and should be required reading for both sexes. If you are a victim of domestic violence, you will find very relevant assistance in Susan Murphy Milano’s Time’s Up guide to leaving stalking and abusive relationships, http://www.amazon.com/Times-Up-Abusive-Stalking-Relationships/dp/1608443604/ref=sr_1_2?ie=UTF8&s=books&qid=1270995969&sr=1-2. If you are a victim of officer-involved domestic violence, Diane Wetendorf’s website and booklets may be useful to you so that you understand the seriousness of what’s happening, http://www.abuseofpower.info/. You may also want to check out the website of the Officer-Involved Domestic Violence Network, http://policedomesticviolence.com/. Remember that abusers can track your Internet use, so be familiar with how to safely access this information before you look, http://www.stopfamilyviolence.org/internet-safety. There is also something critically important that you can do if you are a victim of stalking or violence: document it! Visit http://documenttheabuse.com/index.html to learn more about the critically important Evidentiary Abuse Affidavit and how to safely record what is happening to you. Stacy Peterson is featured on this website. I also advocate having a will and other legal documents in place that explain specifically who should be questioned if you are missing, incapacitated, or dead. Mine is set to automatically disseminate detailed information to people in government and the media. Friends also know intimate details of what I’ve documented and how it is more complicated than what I refer to as my past life. Keep trusted people in the know without your abusers’ knowledge. Doing these things positions a guillotine that will take your abuser’s and accomplices’ heads (figuratively) if they come for yours. So, mock the Peterson movie if you will, but remember that real women are dead and missing. Did this movie convict Peterson prematurely? Perhaps. Personally I believe Peterson’s victims, who had nothing to gain and their lives to lose by standing up for themselves. All the red flags were there. Women who’ve been through similar situations, even of much lesser magnitude, readily recognize the mind games, spins, and manipulation tactics that Peterson appears to practice both in real life and in this movie. It can function as public education. Even if Peterson is pure as the driven snow and did not hurt any of his wives, this quick onscreen walk through suburban Chicago can function as a crash course in the tactics of domestic abusers. Some may see it as entertainment at the expense of the victims and I understand that. Was it right to make this movie? Did the victims’ families give their input, and who’s profiting from it, namely the precious children left behind? I also understand how media coverage can get cases moved to different locales and affect jury selection. I’m not heartily recommending this movie, but I am saying that as long as it’s out there, let’s learn what we can from it. There is reality even in its cheesiest lines that can educate the public on domestic violence and be used to stop it. Knowledge is power. Awareness brings change. We must continue to speak out against the Drew Petersons of this world until domestic violence ceases to exist. Idealistic you say? Given the magnitude of this monster’s reach, especially in law enforcement families, it’s an ideal worth striving for. Great article. Peterson is so ugly and unattractive and I could never figure what they saw in him, but know he must have some charismatic power to draw them in. A "Twilight" vampire is less convincing than this sicko. Thank you! I appreciate the comment. I don't normally like to talk about people's appearances as there could be medical reasons for them, et cetera. In this case I wanted to contrast his appearance with the magnetic qualities he has and the actor chosen to portray him. When you a victim of that, and you're in that hypnotic cloud, you don't see the vampire for what they really are. At least Twilight vampires are honest about what they are before marrying humans.